One of the seven natural wonders of the world, Niagara Falls is likely on the bucket list of most families. Regardless of whether you spend time exploring the Niagara Falls from Niagara Fall NY or Niagara Falls, Ontario it’s still incredibly impressive. The four westernmost Great Lakes feed into the Niagara River before heading over the falls and eventually into Lake Ontario. The falls drop a crazy amount of water: 681,750 gallons per second flowing over Horseshoe Falls to be precise. Falling at speeds of 32 feet per second and creating 2,509 tons of force, visiting Niagara Falls is an experience your family won’t ever forget. But families heading to the Falls might wonder: is it better to explore Niagara Falls NY or Niagara Falls Canada? We wondered that ourselves. So we put Trekaroo writers and contributors to work to determine the best vantage point for viewing this amazing natural wonder! Here’s everything you need to know about choosing where to see Niagara Falls. From the US side, getting to Niagara Falls NY is a breeze. 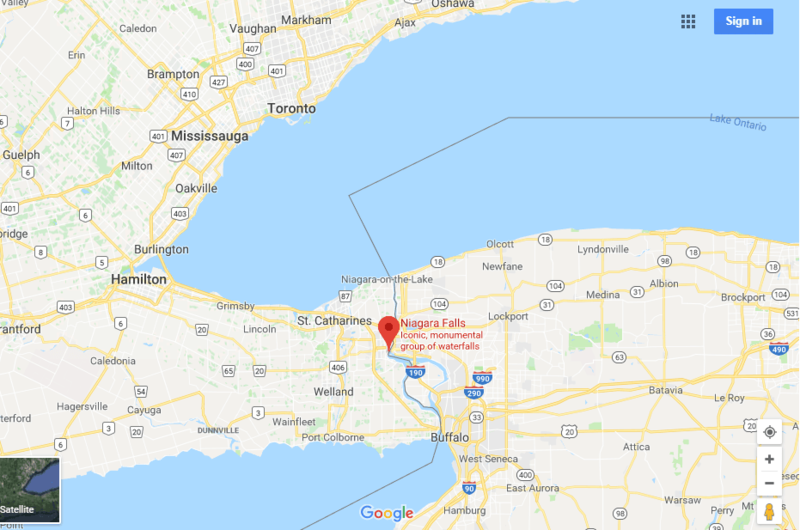 Buffalo, NY is only 19 miles from Niagara Falls State Park. From the Canadian side, getting there is a bit trickier. The closest big city is Toronto, 85 miles away from the Falls. Renting a car and driving this distance is pretty simple. Many families from the Canadian side choose to take tour buses that pick you up and drop you back off at your hotel. My family LOVED our tour with King Tours in Toronto. They picked us up and returned us directly to our hotel, explored the Falls, Niagara-on-the-Lake, and even went wine tasting. The kids made friends on the bus and mom and dad loved not having to drive back in Toronto traffic. Check out King Tours when making your tour reservation. Winner – Niagara Falls New York. Getting to and from the Falls is much quicker on the US side. No matter which side of the border you are on, boat tours are offered that take families to all three falls (Horseshoe, American and Bridal Veil). This experience is one that can’t be missed! There is nothing like feeling the “mist” of the water encompass everything all around you. It is a family-travel memory I will honestly never forget. Hornblower Niagara Cruises operates the Canadian side while Maid of the Mist has been offering tours on the American side since the 1800s. Both tours include ponchos (Hornblowers are red, Maid-of-the-Mists are blue). Tours are both 20 minutes long. And both tours operate seasonally (typically April-November, weather permitting), although Hornblower typically extends its season through the end of November. Prices are similar, and both operators offer similar package deals. Winner – Niagara Falls New York. Cave of the Winds is an experience all in itself. Although most visitors to the area come for the boat and walking tours, there are quite a few other things to do while visiting the Falls. On the New York side, exploring the Falls is all about nature. As part of Niagara Falls State Park, the oldest state park in the US, families can explore the history of the region while discovering the waterfalls themselves. The Niagara Gorge Discovery Center teaches kids about the geology of the region, including fossils and formations. Kids will love the rock climbing wall and hands-on displays. Marked hikes throughout the park take families past ruins of the first hydroelectric station, as well as the opportunity to scramble over boulders. The Adventure Theater, located in the state park visitor center, screens showings of “Niagara: Legends of Adventure,” showcasing the history of daredevils who have braved the Falls. The Niagara Aquarium boasts more than 1500 aquatic animals! The Canadian side of Niagara Falls is all about adventure. 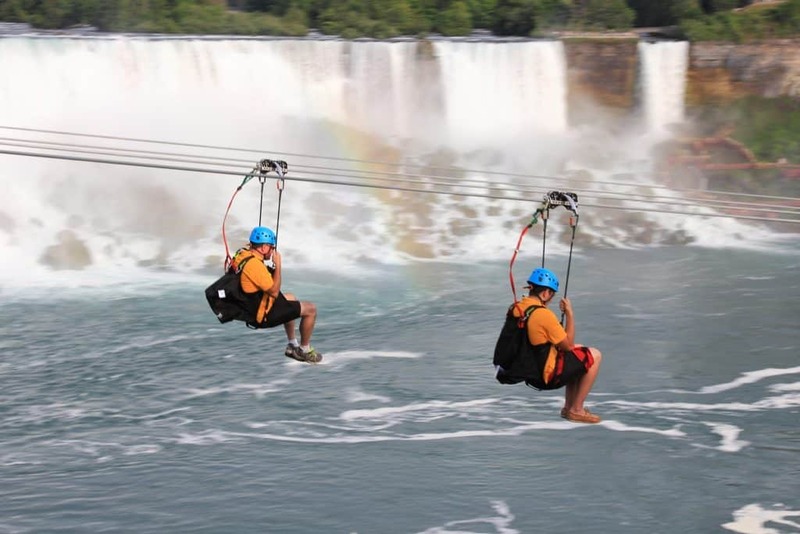 Adrenaline junkies won’t want to miss MistRider Zipline to the Falls, a 2,200 foot zipline past the American Falls to the base of Horseshoe Falls or the WildPlay Whirlpool Adventure Course suspended above views of the Niagara River. The White Water Walk showcases the power of the water as you tour the river on boardwalks that showcase the Whirlpool Rapids. The Whirlpool Aero Car, which is over 100 years old, suspends families over the Whirlpool rapids in antique style. Additional Canadian-side attractions include the Butterfly Conservatory, Niagara Parks Botanical Gardens, the Floral Clock, Niagara’s Fury, a 360-degree 4D theater that showcases the power and history of the Falls, golf, hiking in the nature center, and of course, the casinos. Read details of all the Canadian side offerings in our Guide to Visiting Niagara Falls with kids. 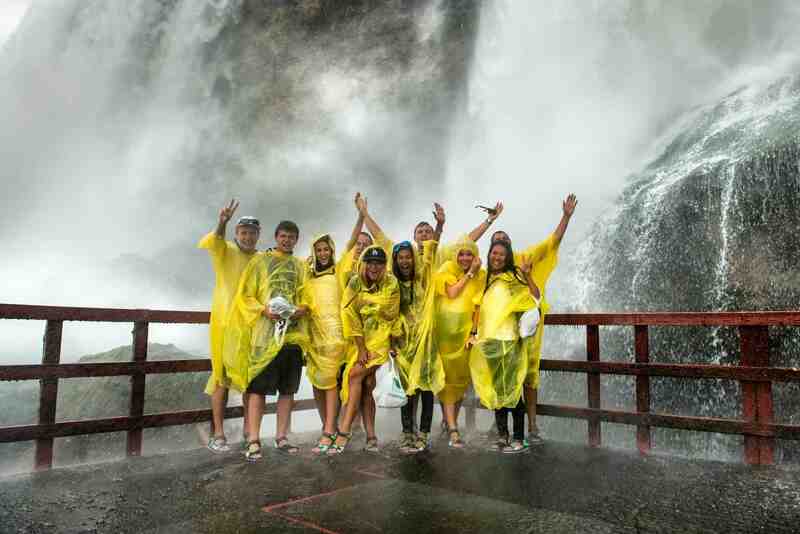 Winner – Niagara Falls Canada for the sheer number of attraction options. Want to get fancy? Book a reservation at a restaurant with views of the Falls. The Canadian side boasts a slew of them, including the rotating views at Skylon Tower, 775 feet above the Falls; The Keg Steakhouse & Bar; Elements on the Falls, for fine dining; and Morton’s Grille. The only US-based restaurant with views of the Falls is Top of the Falls Restaurant. It is located within the state park on Goat Island. Winner – Niagara Falls New York. Although we like the options on the Canadian side, we love the natural focus in the US; there are still plenty of restaurants and options for shopping and snacking, but you won’t feel like you are in a tourist trap. On the Canadian side of Niagara Falls, there are plenty of options for families. From kid-friendly resorts like Trekaroo family-favorite Great Wolf Lodge to Oakes Hotel Overlooking the Falls with impressive views, there is a wide variety of hotel options near the falls and right in the action. The hotel options on the US side of the falls are a bit less plentiful but still diverse. Options include favorite chains like Holiday Inn, DoubleTree by Hilton, Sheraton, Comfort Inn, and more. Check rates on Niagara Falls hotels—Best Rates Guaranteed. Both the US and New York side of Niagara Falls offer bundled discounts to explore the attractions and activities. The Discovery Pass (US) includes Maid of the Mist boat tour, Cave of the Winds, Adventure Theater, Discovery Center & Hiking Trails, Aquarium of Niagara, and Trolley car access. The Niagara Falls Adventure Pass (Canada) offers three bundles, depending on the activities you hope to do. 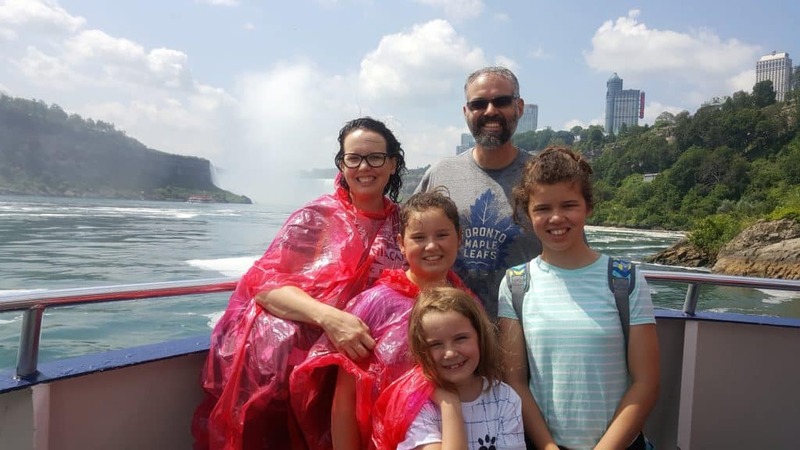 All passes include the Hornblower Niagara boat tour and WeGo bus passes; visitors can then select attractions based on their interests including nature, classic tours, and plus, which allows admission to nearly everything. Winner – Niagara Falls Canada. We like that Canada gives us options on what we want to see and experience. Related: Explore our guide to visiting Niagara Falls with your family. 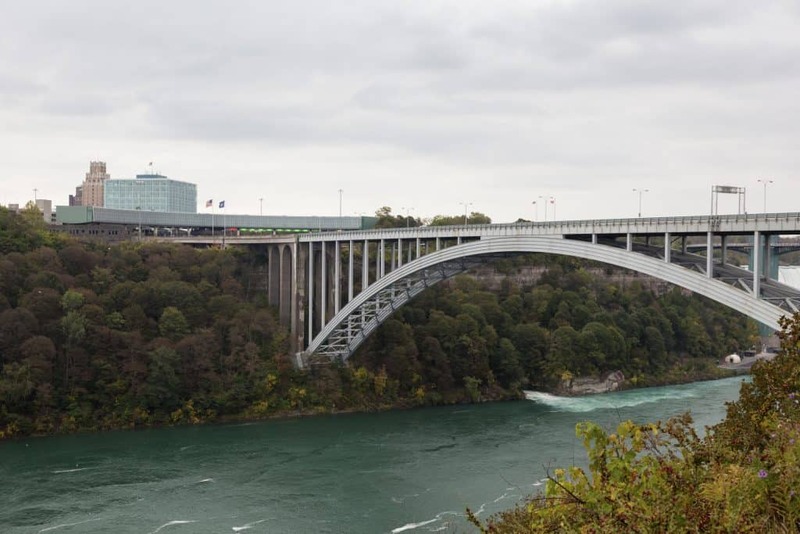 Driving across the border: You can drive across the border at Rainbow Bridge, Whirlpool Bridge (Nexus only), and Lewiston Queenston Bridge. Every passenger 16 and older needs a passport to cross. Kids 15 and under need only a birth certificate to cross. Single parents might need a certified letter with permission to cross the border without both parents. If you are caravanning, be sure your kids are in your own vehicle at the border. Walking across the border: You can also walk or bike across the border on the Rainbow Bridge, a fun option if you don’t want to wait in a line of cars. The same passport rules apply.